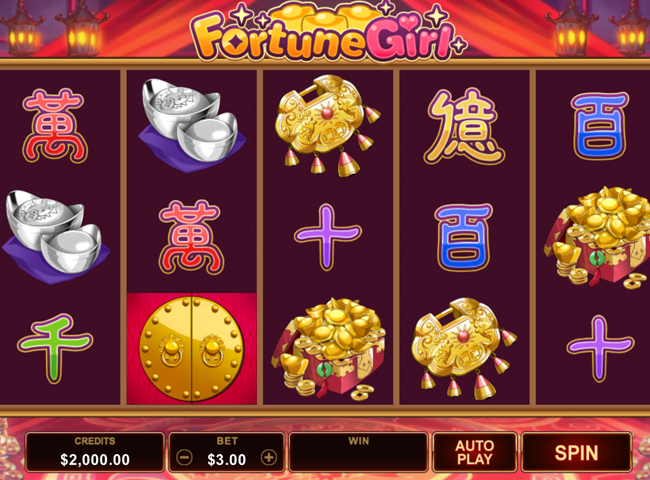 Fortune Girl Slot is an oriental-themed online slot from Microgaming that hit the casinos in April 2017. It is a 5-reel, 3-row, and 15-payline game, with an average RTP (return to player) of 95.86% and a medium volatility. One for all shapes and sizes of players then? Read on to find out. The game is based in a Chinese store and uses Manga-style cartoon graphics, so it should appeal to players who enjoy online slot games like Tokidoki Lucky Town, Koi Princess, Magical Stacks, and Astro Cat. But the real treats here are the special features which include rather tasty Super Stacked Mystery Symbols, a Free Spins Bonus with up to 14 spins, wild substitutions, and multipliers. The Fortune Girl slot takes you inside a traditional Chinese store where vast red silk curtains cover the ceiling, and the rows of shelves contain all manner of trinkets, ornaments, and books. On either side of the shop floor, there are huge piles of golden coins, and the paytable symbols include an abacus, Chinese symbols, coins, teacups, gold vault doors, a Chinese Dragon (the scatter), a young girl, and the Fortune Girl game logo (the wild). The gameplay and graphics are enhanced by a jaunty oriental tune and sound effects which announce each win, but you can switch these off if you prefer. The settings can be accessed via the game’s main menu, and they allow you to alter the coin size (N.B., you can choose from £0.01, £0.02, £0.05, £0.10, £0.20, or £0.25), and the number of coins you wish to play per line (between 1 and 20), as well as enable/disable the sounds and quick spin mode. Depending on your chosen coin size and number of coins played per line, it’ll cost you as little as 15p and as much as £75 per spin. Wild Symbol – the wild symbol is represented by the Fortune Girl game logo, and it can substitute for any symbol except the Chinese Dragon scatter to help make and enhance winning combinations. Scatter Symbol – the Chinese Dragon is the scatter symbol, and it can pay out between 1x and 1,200x your bet when it lands in three or more locations on the reels on the same spin. Mystery Symbols – The image of the Gold Vault Doors is the Mystery Symbol, and it appears stacked in the base game and super-stacked in the bonus game. What makes Mystery Symbols so special is their ability to transform into any paytable symbol except the wild to help you gain bigger prizes. Free Spins Bonus – Triggering the Free Spins Bonus is possible by getting three or more Chinese Dragon scatter symbols anywhere on the reels. You gain fourteen free games and, although the feature is not re-triggerable, you do get to benefit from an increasing multiplier (from 1x up to a maximum of 5x) each time you land three more scatters. Fortune Girl is an upbeat slot with nicely executed graphics that has the potential to award you an astonishingly generous top prize of 1,800,000 coins. The presence of stacked and super-stacked Mystery Symbols means you get more chances of winning than you would with just a wild symbol, and as the game is designed to be moderately volatile, it doesn’t usually take too long to start collecting decent wins.